Andy Haddon is a Director of social enterprise at Earth Doctors, which develops low carbon projects at community scale in the North East of England. Here he talks about the power of bread, and how it can help to shape communities for the better. Well, bread’s quite magical. Everyone loves great bread. The smell of it, the taste of it, and making it. And we think it’s very therapeutic for individuals and communities, and just great fun. We develop bread training programmes in community centres across the north east with the aim being that everyone should be able to get great, healthy bread – the best breads in the world, we think – not just the people with a bit more money. Our ‘One Loaf at a Time’ training course introduces people to bread making, and from that seed we hope more activity develops. Once upon a time everyone baked their own bread. Why do you think it fell out of favour? Ooh. Big question! Well… busy lives, the whole supermarket system, the food system, the disempowerment that comes from that – to people’s skills, their time, and their confidence. It wasn’t just on an individual level in homes – communities had a communal oven and there were a lot of them in the North East. People would bake at the end of the street and share that oven. So in some ways, with a modern twist, we’re trying to bring that back. How can making bread make a difference in communities? I did not want to become the artisan bread version of Marie Antoinette! Telling people to eat expensive artisan bread which they cannot afford. We have found a way to make healthy organic artisan breads affordable and available by getting local people involved in the making and the selling through the community centre and the local school. 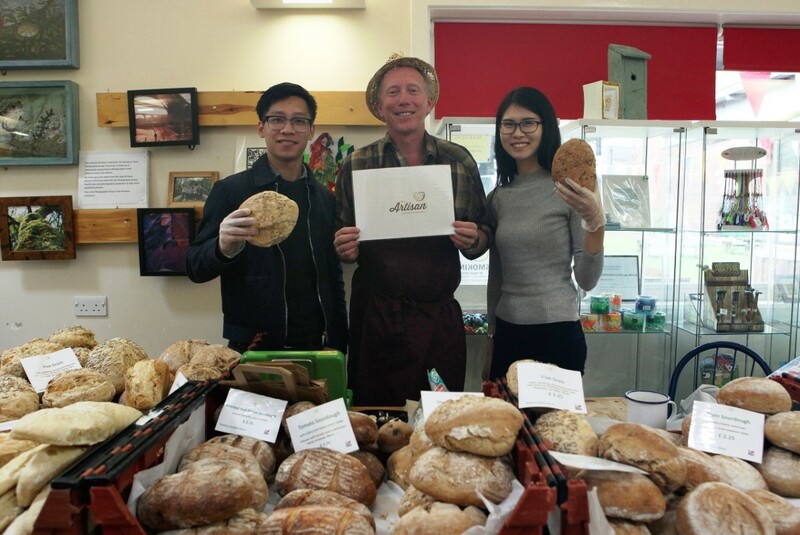 There’s such a lot that comes from the coming together to undertake an activity – it doesn’t have to be bread – but [making] bread’s a great example of overcoming social isolation, it can build confidence in people, help them progress towards employment, and get some lovely bread to eat as well. So there’s loads of benefits that come from the activity. One of our key projects is our artisan baking community project. We started that over three years ago, establishing a bakery in the library in Wiley, in the Tyne Valley – the only bakery in a library in Britain, we believe. It’s had a really positive effect on the local community; three times as many people now come into that library on a Saturday morning to buy bread, so it helps that building be viable. And actually we have just established our first satellite bakery in Gateshead, and there’s been a lot of work gone into that and a lot of collaboration with other groups in that community, the Edberts House charity, specifically. We are now working with a baking group to create a food business in their community centre and are working at another community centre with young fathers who are interested in the idea of wood fired ovens and pizza. So we will work with them to make it happen. Things grow in communities if they develop at the pace people are comfortable with. Rather like our bread. It is about local people gaining trust, confidence and skills to help themselves. Having fun through coming together for the activity and enjoying the end product too. Sometimes it has been chaotic during the holidays we had over 30 mums and kids making healthy pizza – but it’s always fun. Food can certainly be a driver of social change in communities and that is what we do, working one person at a time to change the world one loaf at a time. You can keep up to date with Andy and the bread making community on Twitter @ABCrealbread and Facebook, and watch them in action in this video.